It’s amazing to me how connected the cultures of the world are. One can no longer separate east and west when we see the art of northern India / Pakistan during the early years of Buddhist art. Buddha’s life is considered by scholars to date between the late 500s to early 400s bce. The earliest images of the Buddha appeared during the time of the Kushan dynasty in India (ca. 50–320 ce). The Kushan Dynasty replaced the Mauryan Dynasty (322–185 bce), the dynasty that unified various states into a distinctive Indian kingdom after the invasion of northern India by Alexander the Great (died 323 bce). It was during the Mauryan Dynasty that Buddhism was adopted as the official religion, but it was under the Kushan Dynasty that Buddhist art had its first flowering. The Kushan moved to India in the first century bce from the western border of China (the Chinese called them the Yuezhi). Although the Kushan did not seem to have intended to conquer northern India, these Caucasian, nomadic peoples filled a power vacuum left by the disintegration of the Mauryan dynasty. They became affluent trading with the Roman colonies in what was left of Alexander’s western colonies. This is evidenced in the large issues of gold coins that bore likenesses of Greek, Roman, Hindu, Iranian, and Buddhist deities. This indicates the cosmopolitan, tolerant attitude of the Kushan rulers. After the rise of the Sasanian Dynasty (222–650 ce) in Iran, and the rise of other states in northern India, Kushan rule declined. Enduring, however, are the first images of the Buddha. They are variously labeled “Mathuran” (after one of the Kushan capitals) or “Gandharan” in style. In the city of Gandhara, the meeting of Buddhist thought and the Greco-Roman sculptural style resulted in one that transferred the features of Apollo to the Buddha and bodhisattvas (saints). The Gandhara Buddha/Bodhisattva style is a perfect example of the merging of Roman realism with Indian conceptualism. The rounded face is indicative of the Indian tendency to geometricize the classical western style. 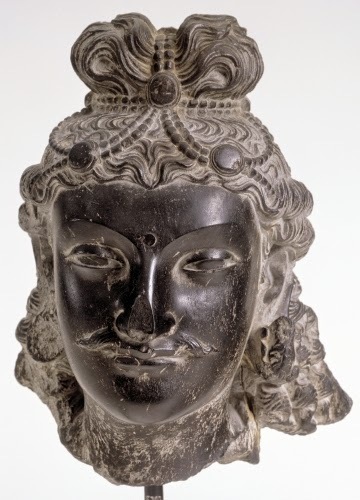 The Gandharan style is typified by an oval face, long straight nose, arched eyebrows, and cupid’s bow lips. It is modeled on the face of Apollo with a moustache added. The wavy hair tied in a bow, a Greek hairstyle, emulates the Buddhist conception of the ushnisha or top-knot on the Buddha’s head. The jewelry is both western and Indian. There is much turmoil in the world these days. But I always have hope for humankind coming together as a “global village” when I learn about cultures like the Kushan, who were at the crossroads of Asian and Western cultures, and amalgamated them into their own peacefully.